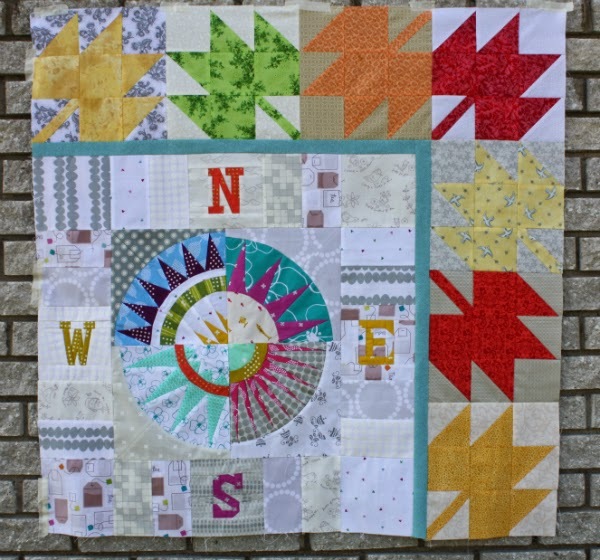 Devoted Quilter: Round Trip Quilts - Round 1! I had a lot of fun adding my contribution to Jennifer's quilt start for the Round Trip Quilts group. Jennifer, of Never Just Jennifer, sent this gorgeous piece to me as the beginning of her quilt. 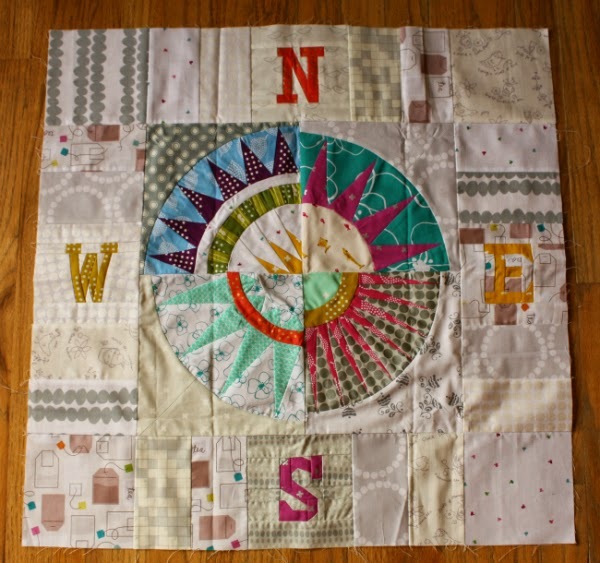 The theme for her quilt is "New Hampshire Beauty." 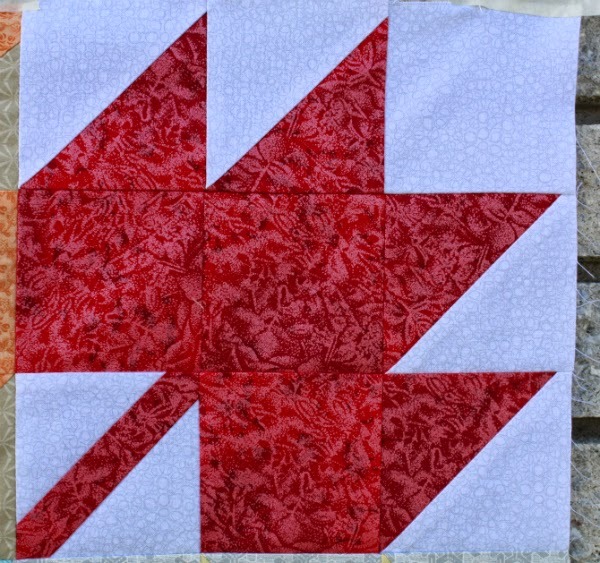 She included lots of ideas for things she'd like to see in her quilt, including maple leaves. As the only Canadian in the group, it seemed only fitting that I be the one to add them. And of course that meant there would be one red leaf on a white background. I love the birds flying around on this yellow leaf! 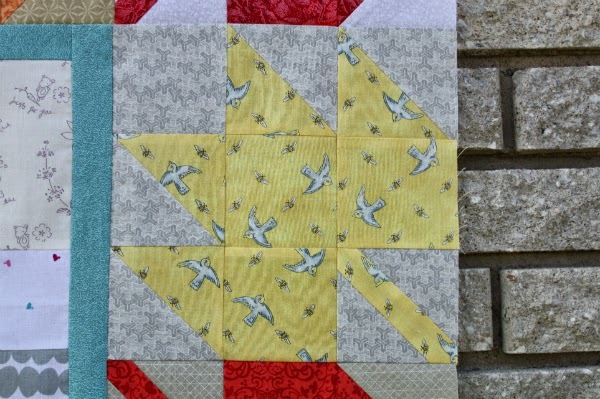 I followed this tutorial by Erin of Sew at Home Mummy, though I made my blocks 9" finished rather than 12". Before I could add my leaves to Jennifer's starting piece, I added a 1" teal strip to two sides to bring it up to 27" so it would work with my blocks. Jennifer said she didn't want a traditional medallion style quilt, with borders on borders on borders, so I chose to add to only two sides of the quilt top. I chose the north and east sides because I live in Newfoundland, which is northeast of Jennifer in New Hampshire. That's it for me for round one! Now I have to wait until the middle of October before I can mail this to Mary, of See Mary Quilt, to add her contribution. Next up for me will be Liz's quilt (Green Cheese Quilting), which Jennifer has now. I hope you like your maple leaves, Jennifer! Beautiful. I love the meaning behind the leaves and their placement. Lovely addition - this is looking really good! I really like the idea of sharing a quilt, each person adding a part, such a powerful quilt. The maple's leaves fit right in. So pretty! I love that you even considered which sides to add to! That makes it so much more memorable! *sob* makes me miss home even more! LOVE IT!!! I love how you added your pieces on the NE side of the compass since you live NE of Jennifer! Such a fun idea!